Valentine's Day has come and gone, but the serious deals on romantic wares can make a difference on your wallet for months afterward. Besides the obvious grab of delicious discounted chocolates to enjoy on the car ride home, there are plenty of ways to make these sales work hard for your budget all year long. Take a look at these ideas. 1. 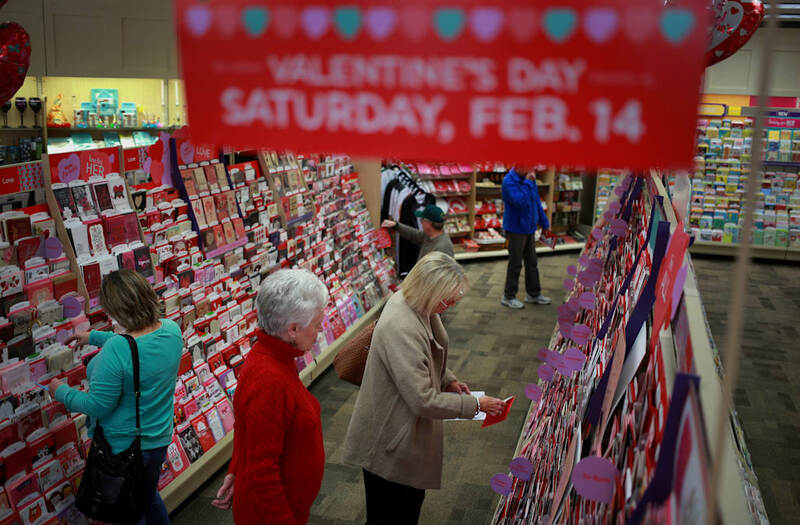 Gift wrap: Wrapping paper, gift bags, ribbons and bows merchandised for Valentine's Day will be on significant discount in the days following the holiday as stores try to clear the shelves. Why should you stock up? Valentine's Day gift wrap is versatile. The red can work well for a birthday or Christmas. Pink is perfect for a baby shower. The romantic hearts and flowers theme is ideal for wrapping an anniversary or bridal shower gift. Don't forget red tissue paper and white ribbons, these will work in seamlessly with your holiday gift wrap later this year. Check the shelves at drugstores and box stores for low-priced gift wrap, and hit up the dollar stores for even more drastic discounts. 2. Wedding decor: Are you planning a wedding this year? Romantic housewares and party decorations are in stores in abundance during Valentine's Day, and prices will be slashed in the days after. Look for paper products, such as tablecloths, cups and plates, which are perfect for a casual bridal shower or bachelorette party. Other items to look for include heart-shaped balloons and garland, photo frames and love-themed decor – perfect touches for a wedding. Keep an eye out for artificial flowers and floral arrangements. Flowers can be one of the most expensive parts of a wedding budget. Consider a do-it-yourself approach to centerpieces, garland or bouquets to save money. If you are making any wedding decorations with artificial flowers (even just petals for the aisle), check out craft and box stores for discounted prices on white, red and pink items. While you're at the craft store, look in the scrapbooking section for deals on stickers, embellishments and paper goods that might come in handy for your invitations or albums. Right after Valentine's Day is also an ideal time to visit jewelry stores. Future brides and grooms should consider the post-holiday sales when shopping for their wedding bands, as well as any gifts for the wedding party, such as necklaces, cuff links or commemorative picture frames. Heart-shaped candy and chocolates could be perfect wedding favors or additions to a gift bag. Sweet treats marked for Valentine's Day will be up to 70 percent off starting Feb. 15 and typically have a long shelf life. Just double-check the expiration dates and make sure that you store your goodies in a cool, dry area. 3. Baking supplies: Speaking of candy, you can freeze chocolate and candy pieces for several months afterward to use later in recipes. Many of the items, once unwrapped, look the same and are still the same color – only the packaging is merchandised for Valentine's Day. You can even use individually wrapped chocolates or fun-sized candies in a few months for hiding in Easter eggs or including in Easter baskets. You can also include small portions of candy into trail mix with nuts, raisins and dried fruit for a well-balanced snack. 4. Future valentines: If you like to celebrate Valentine's Day with your loved ones, or you have children who share the tradition in school with their classmates, now is the time to stock up on cards and boxes of valentines. Everything is typically priced at least 50 percent off, and you'll thank yourself in 12 months when your shopping is all done for a fraction of the cost. If you're a teacher, pick up supplies now that you might want for next year, like classroom decorations and paper goods. Ready to fall in love with post-Valentine's Day sales? Don't limit your shopping to the brick-and-mortar stores. Check online, and you might find additional coupon codes for free shipping or a site-wide discount on top of your sale items. Clicking through a cash-back shopping website before you purchase will get you a percentage back of what you spend. Who knew that romance could bring such great deals?